Sometimes I get the feeling Day One is used by many as everything but a standard journaling app — and I certainly mean that in a complimentary way. I’ve previously written about how I use the app for logging workouts (the recent regularity and frequency of which we won’t talk about if you don’t mind). Since that time, Day One has been refined and updated, yet retained its core features and attractive UI which so many users have come to love. As the title of this post suggests, this is not a review of Day One as such — more so another in that long list of use cases I’ve linked to above, in which the app excels at being used for a specific purpose. 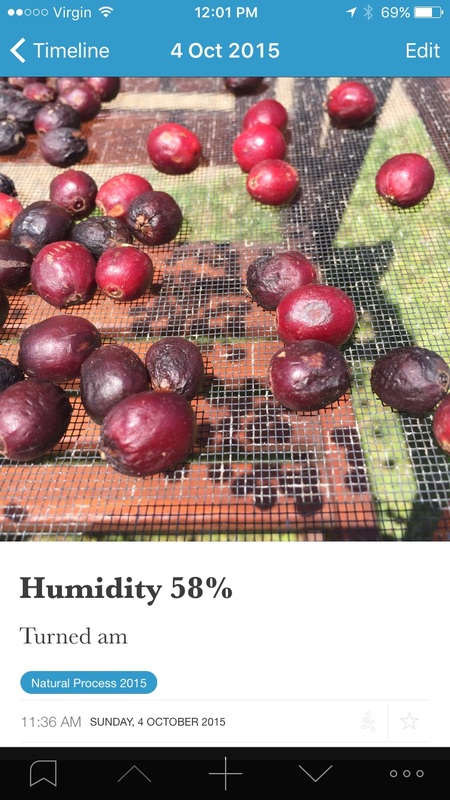 Exactly two years ago I ran a little experiment on coffee processing using the wet or washed method, and documented the experience in a series of posts titled Crop to Cup.. I am currently in the very early stages of a follow-up experiment to see how a small crop of coffee tastes after I process the fruit using dry processing methods. Clearly an undertaking which requires monitoring and data collection along the way — enter Day One. Day One is a journaling app for the iPhone, iPad and Mac. Record life as you live it. From once-in-a-lifetime events to everyday moments, Day One’s elegant interface makes journaling your life a simple pleasure. I’d certainly agree with that sentiment, though I’d encourage you to see what the fuss is about for yourself if you haven’t already. Of course there is a significant amount of information on the Day One website, however for a review about as beautiful as the app itself, there is none better than this one over at The Newsprint. As I mentioned above, coming up in a post or two in the near future will be my attempts at a small experiment in dry processing of some coffee grown in the yard of my parents house in northern NSW. The coffee will be sun-dried with either the entire cherry intact (“Natural” process) or with the outer flesh removed first(“Pulped Natural” or “Honey”) process. More on this in future posts. Although hardly a large-scale endeavour (or an overly professional one for that matter), I will need a record of how things progress over the course of approximately a month as the coffee transforms from its current state to something resembling being done1. In considering my options here, when thinking about recording recurring data over a number of days, my thoughts invariably turn to spreadsheets. Immediately thereafter my thoughts then turn to the fact that I am buried in spreadsheets on a daily basis and considering combining an enjoyable hobby with this type of data analysis makes my stomach turn a little. If a spreadsheet was by far and away the best solution I would of course use it, however when other options are available I’d prefer to head in another direction. All well and good (with the bottom two from the above list not required here), however what about relevant data not automatically captured by Day One? Probably the key here is the relative humidity (the number one enemy of dry processing), over and above simple temperature data. I assume Day One simply pulls in the system weather information, which in itself, does not include humidity. Manually entering this as not a major issue, with the advantage of having what is recorded automatically by Day One providing a significant head start over a manually maintained spreadsheet. 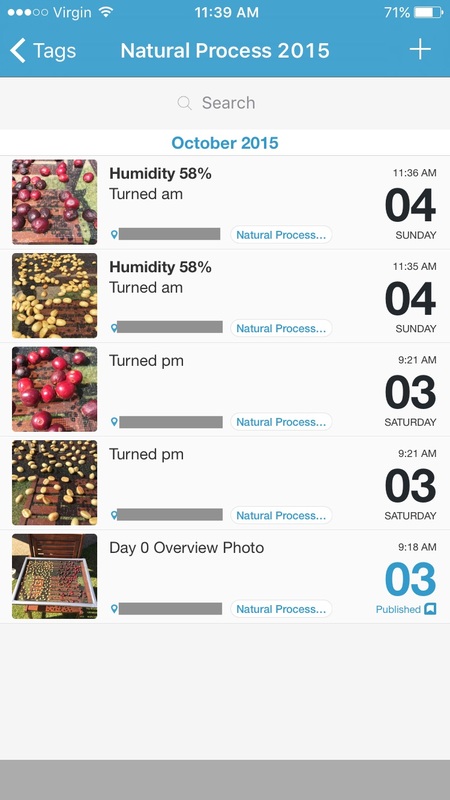 Regardless of which system I use, there is the requirement for some sort of “Additional Comments” section, and it is here I will simply add the humidity reading (easily obtained with one tap from the best iOS local weather app there is: Pocket Weather Australia), along with information on how often I turn the drying beans (hint — it’ll be often), and anything additional worth commenting on for that particular day. I don’t anticipate capturing a lot of additional information, as things will be fairly standardised day-to-day, however any significant changes or data outliers/modifiers will be noted specifically. As this additional data will in itself be fairly similar day-to-day, a customised template using Launch Center Pro might also be on the cards. Of course the non project-critical feature of sharing through Day One’s Publish feature will allow me to Tweet daily updates of the drying beans for your viewing pleasure. No — of course I won’t! Ever watched paint dry? Perhaps the occasional one… maybe. The benefits of organisation by tag, along with rock solid sync and export options (PDF, with entries for export selectable by tag on iOS), will also keep my data organised, safe, and allow a better overview of how things went when the processing is complete. One feature which would have been nice is the ability to upload multiple photos per entry, thus keeping each day to a single entry2. No real complaints here though, as the Day One Newsletter tells me this is coming (along with refinements to the interface and multiple journals) in version 2.0, which will hopefully arrive before the end of the year. Overall, Day One is just about perfect for what I require in terms of data collection and handling for a project of this nature and size. It’s a pity there is no “taste guarantee” built in to the app — for that I’ll just have to take my chances. Irrespective of how things turn out, the entire process will be far more tasteful using Day One for recording purposes than the bitterness of nibbling on another spreadsheet every day. Here’s to an enjoyable (and hopefully successful) journey, with a glorious cup of “natural process” coffee at the end. Wish me luck.